This pua comprises two hand-woven panels of machine-spun cotton hand-stitched together down the middle. 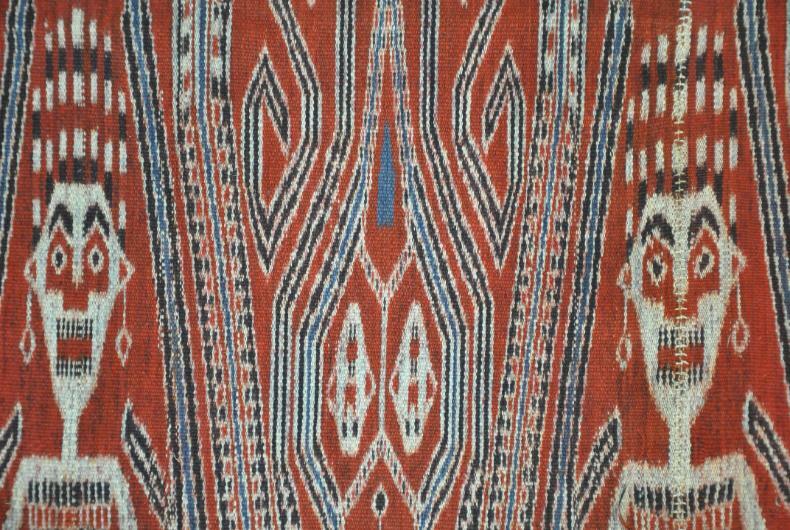 The supplementary weft pattern shows multiple images of Iban warriors with feather headdresses and long earrings. They wear particularly vivid costumes. There are skull or head motifs – an allusion to headhunting. Other motifs are suggestive of animals, perhaps croc0diles. It includes borders on either side: many pua patterns were deemed to be potentially dangerous and so the borders were necessary to contain that power. The ends of the textile are braided. 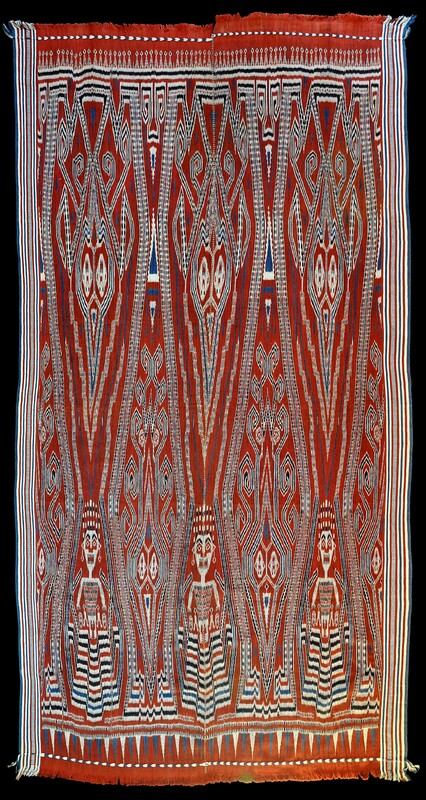 This textile belongs to a group of large blanket-like hangings known as pua. Mostly, pua cloths are patterned with warp ikat patterns in earthy deep reds, browns, beige and blue-black colours. 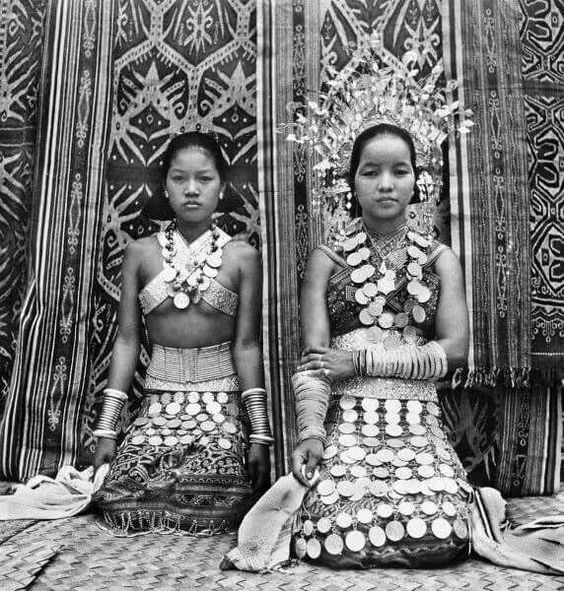 The pua are believed by the Iban to communicate with the spirit world and to protect individuals during times of danger and crisis (Gittinger, 2005, p. 102). 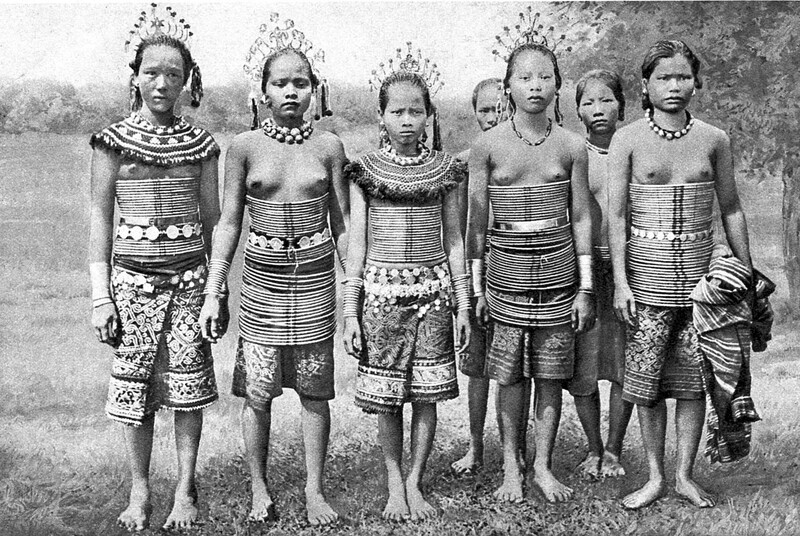 Pua were used at various harvest-and life-cycle rituals known as gawai. Villagers would gather at a longhouse for several days of feasting during which the gods were invoked to leave their heavenly abode and visit the earth. 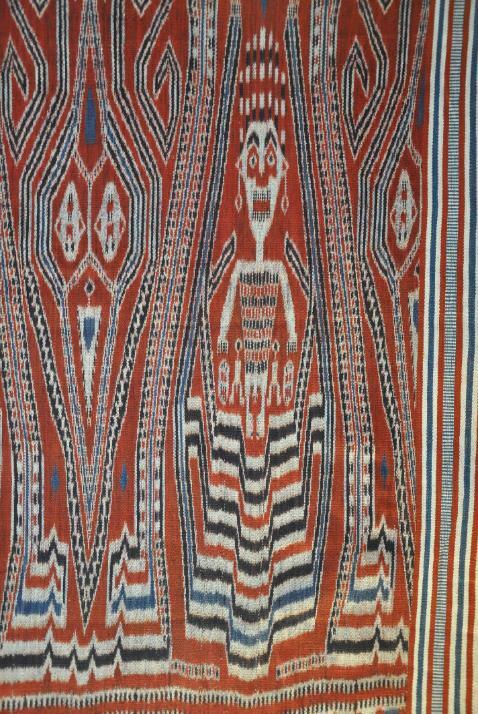 The pua were hung about and near the longhouse to greet the arriving gods who would take pleasure in seeing the large textiles. The gods would respond by bestowing blessings on the festival givers and attendees. Pua could also be used to create a temporary shrine to enclose ritual objects. Certain puas might have been hoisted as a signal that a longhouse was in mourning, or hung to assist with healing and sickness rituals. Woman were responsible for weaving the pua. But the task was a perilous one. The weaver was at the interface of the physical and spiritual worlds and the supernatural powers potentially endangered the weaver and also empowered her patters. According to Gittinger (2005, p. 105), a woman may receive inspiration for a pua pattern in a dream inspired by the spirits. She must follow such commands or risk severe physical or mental malaise. Those women deemed to be the best weavers were honoured the most in the community for it was felt that their connections to the spirit world were the most intense. 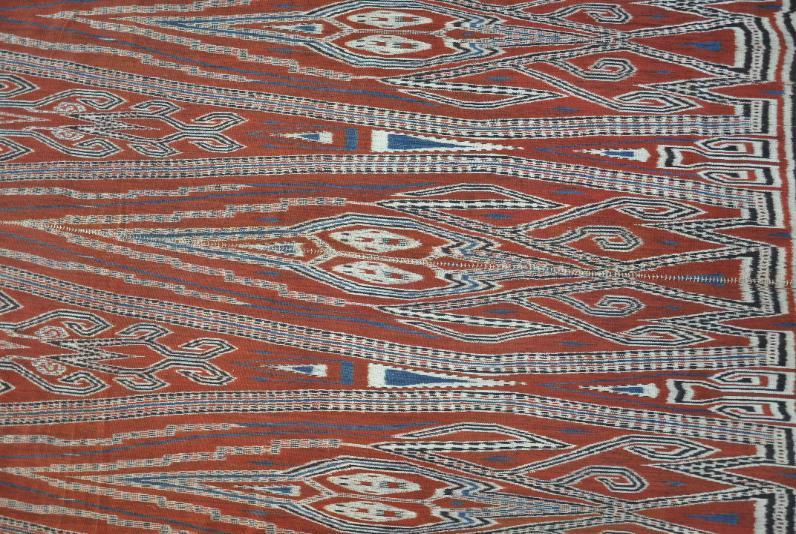 The last few images show pua textiles in use during the early 20th century. 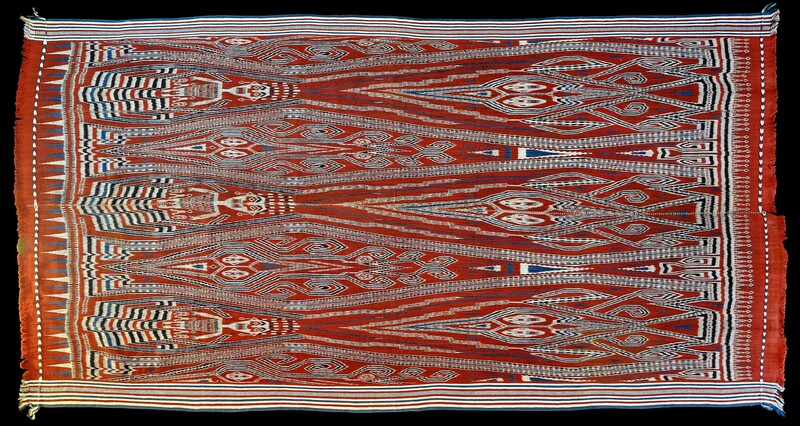 Gittinger, M., Textiles for this World and Beyond: Treasures from Insular Southeast Asia, Scala, 2005. Haddon, A.C., & L.E. 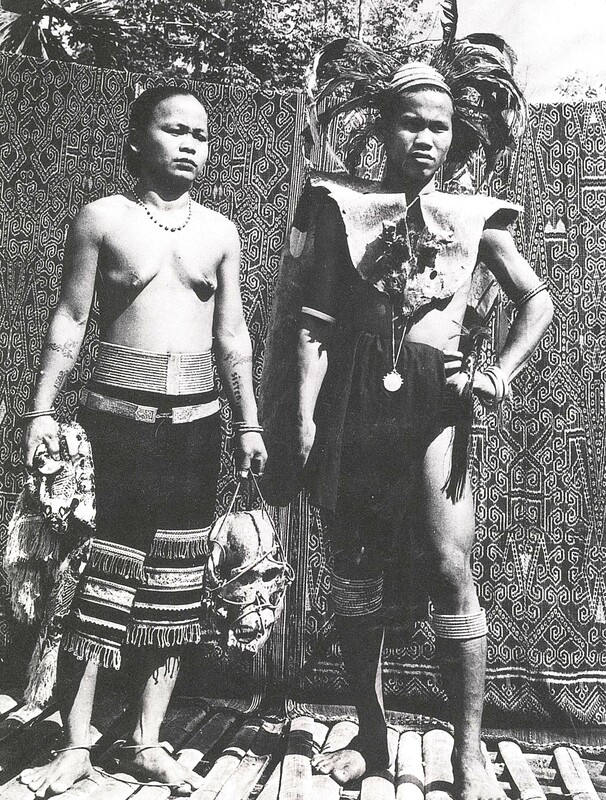 Start, Iban Sea Dayak Fabrics and their Patterns, Ruth Bean, 1982 (reprint of 1936 edition). Heppell, M.,e t al, Iban Art: Sexual Selection and Severed Heads, C. Zwartenkot/Kit Publishers, 2005.